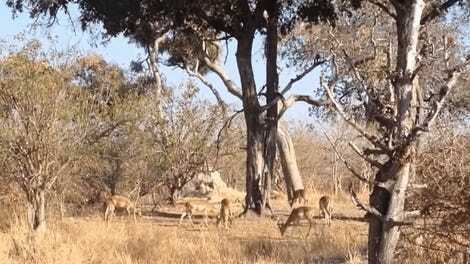 While on safari in northeastern South Africa, a retired couple witnessed a harrowing scene involving a crocodile and a rather unfortunate wildebeest. But just when things appeared most grim for the reptile’s next meal, something completely unexpected happened. This remarkable scene was captured by 72-year-old retiree Mervyn Van Wyk and his wife Tokkie while visiting Kruger National Park, one of Africa’s largest game reserves. As the couple approached a dam, they noticed several wildebeest, zebras, and impalas grazing on the opposite side, so they turned the car into a position such that Ms. Van Wyk had a clear view to take some photos. 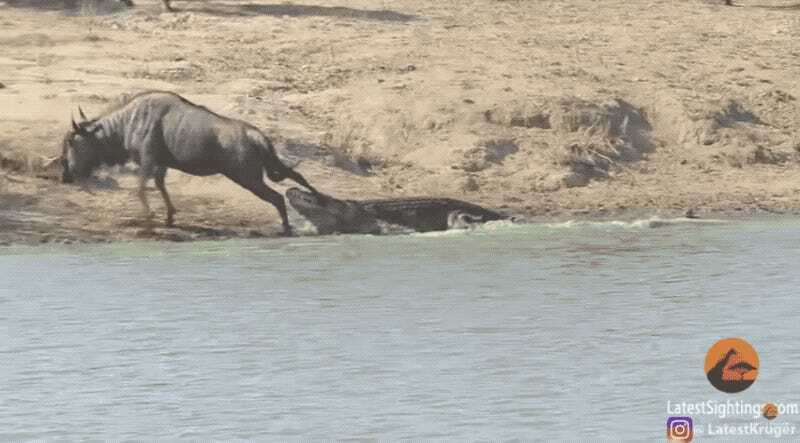 As the video shows, the hippos slowly approached the scene and then, incredibly, sprang onto the crocodile, forcing it to release its death grip on the wildebeest. The prey animal took advantage of the situation and escaped—though it appears to have a very badly broken hoof. Sadly, this animal will likely not survive. An obvious question to ask about this episode is why a pair of hippos would even care about the member of another species. Evolutionary biologists have a hard time explaining altruism and empathy among members of the same species (what’s referred to as kin selection) let alone members of completely different species, as is the case here. In this instance, however, altruism likely has nothing to do with it. Hippos are territorial animals, and they don’t like sharing their turf. Ironically, the hippos probably perceived the wildebeest as an intruder, and this “rescue” attempt might have been an effort to shoo the struggling mammal away.